Cultural Revolution restaurant Many of the Red Guards that took part in the Cultural Revolution are now middle-age men who "ride bicycles to the market and live next door." Some veterans feel a sense of nostalgia for the Cultural Revolution. They have formed clubs and meet at reunions. 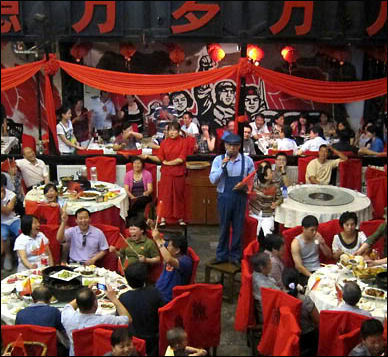 Some of them meet in Cultural-Revolution-themed restaurant that serve peasant food and are decorated with Mao memorabilia or go on Cultural Revolution vacations that recreate the re-education experience in the countryside with mare's milk drinking, cow dung shoveling, boiled mutton eting and the singing of revolutionary songs. Some never got over their Cultural Revolution experience. Many well-educated sons of academics and elite melted into the countryside, married local women and became peasant farmers. Some of residents of Shanghai and Beijing sent to the countryside during the Cultural Revolution now can not get work permits to come back and have returned as migrant workers. 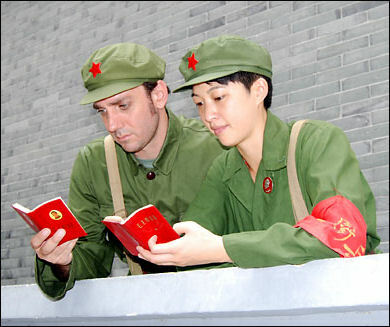 In Hangzhou, China, couples are getting married and having their wedding pictures taken while dressed up like Red Guards in green military outfits with Red Star on their hat and Mao Zedong badge pinned to their uniform, “It's just different from other wedding pictures. I think it's very cool, but it doesn't mean it is related to the history of the revolution,” a 24-year-old advertisement company worker who is marrying 26-year-old dancer told AP. Such restaurants are part of a boom in Chinese tourism and entertainment venues catering to revolutionary nostalgia. To many, the idea of a Cultural Revolution’themed dining establishment is paradoxical, since tasty cuisine was certainly not that era’s strong suit. 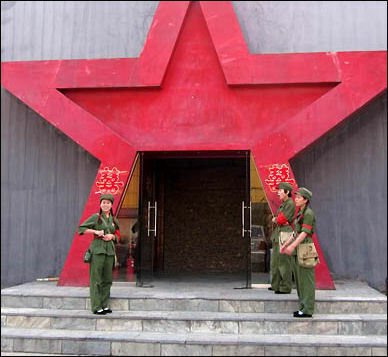 The first “Red restaurants” sprouted in Beijing in the “90s, offering little more than a few socialist-realist posters and food that was minimalist in the literal sense of the word. One served dandelion-leaf salad and raw cucumbers to symbolize the grass and bark that some poor Chinese ate during the hardscrabble “60s and “70s. Now Red-restaurant cuisine is more in line with middle-class tastes. In Mao’s hometown, “the Chairman’s Favorite”---roast fatty pork---is a must, while Red Scene offers a pricey shrimp dish for $27 alongside less-expensive cornmeal cakes and country-style bean curd. By Western standards, Red Scene’s clients aren’t big spenders---an average check is about $12 per person---but that isn’t mere peanuts for most Chinese, either. p> The emergence of songs, dances, and vignettes evoking Cultural Revolution conflict is an equally significant change over the past decade. Before that, anything that exacerbated “class struggle,” or focused on the gap between the haves and the have-nots, was considered too sensitive for public airing. But Red Scene, which opened in 2005 and serves an average of 400 customers a night, is a good example of how many older Chinese have forgotten the dark side of that era<and how a younger generation never really knew it to begin with. During the skit vilifying an arrogant landlord, diners applauded and waved little red flags (conveniently provided by the wait staff). This year, such “Red” venues are peaking in popularity because the Chinese Communist Party celebrated the 90th anniversary of its founding in July. Local governments are promoting “Red tours” to legendary sites along the Long March route, and organizers of a Red China Tourism Expo said such sites across the nation have received 1.35 billion visitors---or a fifth of all tourism traffic---in recent years. They expected a fivefold annual increase in 2011 over 2010 numbers. Many of the Red-restaurant clientele were urban youths during the Cultural Revolution. In a nationwide campaign, they were sent to the countryside to reap the fruits of manual labor. These sojourns were often filled with long days of backbreaking work in the fields and lonely evenings. Still, many were inspired by communal life down on the farm. One such youth, Huang Zhen, decided to open Beijing’s Red Flag Fluttering restaurant in 2007, ‘so that people can remember the past,” he told Xinhua News Agency. Huang, now 58, instructed waiters to memorize Mao’s quotations and to dance the “loyalty dance” of the Cultural Revolution era, which involves a lot of fist-clenching to symbolize revolutionary ardor. “Sipping a large bowl of coarse corn porridge, Ms. Li and her husband said that the food reminded them of the home-style dishes they used to eat, including goose stew and a dish of stewed pig. Still, she said the restaurant presented a rosy vision of the past. “We were so poor. 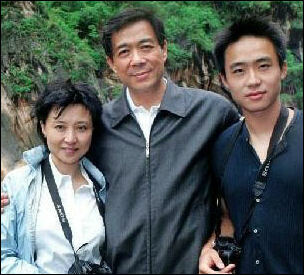 Ordinary families could hardly to afford newspaper to cover the wall,” Ms. Li said. Her 66-year-old husband, Dong Lisheng, said that when he was young, he was never able to eat goose stew. “I knew the dish was made in that part of the countryside, but we could never afford it,” Mr. Dong said. “A few tables away, another older couple also reminisced about the early days of their romance, which they likewise struck up thanks to Mao’s campaign. “I chased her. She was so beautiful!” said 66-year-old Wan Jiajun, beaming at his 63-year old wife, Yu Min, who was originally from Beijing but met Mr. Wan in Inner Mongolia during the Cultural Revolution, when the two were herding sheep and horses. The duo moved to Beijing in 1994. Bo also gained notoriety for a citywide campaign to revive Mao-era communist songs and stories, dredging up memories of the chaotic Cultural Revolution, although Bo claimed he wasn't motivated by politics and only wanted to boost civic pride. The campaign fizzled after initial bursts of positive publicity. And in what seems like a throwback to the days of the Cultural Revolution, residents have been encouraged—or told—to read revolutionary books and poetry and to gather regularly in parks to sing old songs extolling the Communist revolution. A recent Sunday gathering, including a colorful, choreographed stage pageant, attracted an estimated 10,000 flag-waving people, many in uniforms and red caps and mostly organized by the party chiefs in their schools and factories. The red culture campaign revival is the pet project of the local Communist Party secretary, Bo Xilai, a former commerce minister and son of Bo Yibo, a Mao Zedong contemporary who was persecuted during the Cultural Revolution. Bo defended the red culture campaign, saying, “We aim to encourage people’s spirits.” He said his campaign has four aspects: reading Chinese and foreign classics, including the theories of Mao and other Marxist leaders; telling popular stories; circulating inspiring mottos; and group-singing of revolutionary anthems. “We should spread these things more,” Bo said. More than 10,000 students and faculty members participated in the event last month. Although Zhang wore an evening gown, other students were dressed as Red Army soldiers, with red epaulets and armbands. Carrying red flags, they danced around a university athletic field with arms swinging rhythmically to martial music harking back to China circa 1966. Throughout China, people are singing and dancing in homage to the Communist Party. The "red song" campaign began in Chongqing, where it was launched by party Secretary Bo Xilai, an ambitious politician who is believed to be angling for a seat on the Standing Committee of the Politburo. "Red songs depict China's path in a simple, sincere and vivid way," Bo was quoted as saying by state news agencies in November. "There's no need to be artsy.... Only dilettantes prefer enigmatic works." In conjunction with the 90th anniversary celebration in 2011 of the founding of the Communist Party of China was in Shanghai in 1921, the red song phenomenon has spread throughout the nation. In Beijing's subways, television screens show transit employees competing in a red song competition. In some parts of China, karaoke clubs have restricted playlists of Taiwanese love songs in favor of patriotic mainland ballads. Under orders from the local propaganda department, Chongqing satellite television suspended its soap operas in favor of patriotic songfests. From April 20 to May 20, local newspapers had to publish the lyrics to familiarize the populace with the songs.Outside the airport, a billboard as high as a seven-story building features photographs of pink-cheeked young Chinese students and workers urging the public to "Sing Red Songs! Spread the Truth! Raise Your Spirits!" In public parks, retirees set up portable stereos and dance in long lines to songs praising Mao, even in Shapingba Park, which is next to an overgrown cemetery where thousands of people killed in the fighting of the late 1960s are buried. No doubt there is a genuine gusto for red songs, particularly among the older generation, for whom Communist marching songs are the campfire tunes of their childhood. On a balmy recent evening, a dozen people twirled through the dark in Renmin Park, the dancing figures illuminated by slivers of fluorescent light from a nearby beauty salon. "We know these songs from our youth. We grew up with revolutionary spirit and we want to pass that on to our children," said Cai Derong, 55, who wiped his brow as he watched his wife, dressed for the occasion in a silky black-and-white dress, dance with one of her girlfriends. "Our economy is good. We want to express our appreciation to the Communist Party," piped in a middle-aged woman, Zhang Jin, who was also taking a break from the dancing. To critics, the Maoist revival has echoes of the maniacal quest for political correctness during the Cultural Revolution. "People with a sense of history look at it and wonder whether it is possible to go back to an era in which cruel things would happen again," said Alan Zhang, a recent law school graduate from Chongqing and blogger who, like other students interviewed, agreed to be quoted using only an English name. "The red song campaign has made Chongqing a laughingstock," he said. "It's not that everyone is required to sing and love the songs. What we are seeking is a wider participation," Xu Chao, the Chongqing official in charge of the program, told the party-controlled Global Times. When the invitations were sent out, students jokingly turned red song into a verb, saying to one another "I've been red songed. Have you been red songed?" Participation meant going to rehearsals up to twice a day in the weeks before the May 11 performance. "I didn't see a single student who sang these songs with passion," Vicy Zhang said. It wasn't just the inconvenience; the politics were distasteful to the students too. They said the performances looked just like the "loyalty dance" everybody was required to do during the Cultural Revolution, moving arms from the heart to the sun in a display of boundless devotion to Mao. As soon as the music died, one of the older men sat down on a stone bench next to a reporter and in a loud voice offered up contrary opinion. "These people are all afraid to tell you the truth. They're dancing to these red songs because it is all they have in their brain. For 40 to 50 years, they've heard nothing else. The propaganda songs have drowned out regular Chinese folk music," said the man, Hu Jiaqing, 60. "It is just like the Cultural Revolution: They're using these big campaigns and movements to cover up their social problems.” None of the other dancers argued. They just drifted away in the dark.